GM's main production line at its Bowling Green, Ky., factory, where the Chevrolet Corvette is assembled, did not operate on Thursday because of severe winter weather. General Motors, Ford Motor Co. and Toyota Motor Corp.’s plants resumed production today after some canceled shifts because of hazardous weather in the South and Midwest on Thursday. One GM plant in Tennessee canceled production shifts today. The three automakers canceled shifts at assembly plants in Kentucky on Thursday after more than 2 feet of snow pounded parts of the state overnight, prompting some government officials to declare an emergency. 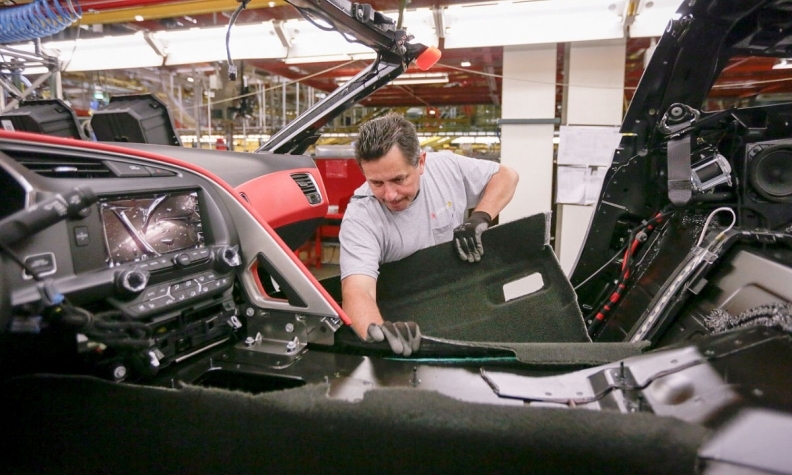 Production at GM’s main production line at its Bowling Green plant, where the Chevrolet Corvette is assembled, resumed today. It did not run on Thursday because of the weather, a spokesman said. In Tennessee, GM canceled production shifts today at its Spring Hill complex, which assembles the Chevrolet Equinox. It plans a makeup shift on Saturday. Ford’s Kentucky Truck Plant in Louisville and Louisville Assembly Plant operated at full production today after running at minimal production Thursday, a company spokeswoman said. The Kentucky Truck Plant produces F-series Super Duty pickups, the Ford Expedition and the Lincoln Navigator. The Louisville factory assembles the Ford Escape and Lincoln MKC. Toyota said shifts at its Georgetown, Ky., plant were running today. On Thursday the first and second production shifts were canceled because of severe weather, a spokeswoman said. The Toyota Camry, Avalon and Venza are produced at the factory. Operations at Toyota’s plant in Princeton, Ind., were also back to full production today after they were down because of inclement weather Thursday. The Sequoia, Highlander and Sienna are produced at the plant.